On December 8, the House of Representatives passed the Full Year Continuing Appropriations Act which is the vehicle for Fiscal Year 2011 continuing appropriations and food safety legislation. This legislation puts the federal government and the World Trade Organization in control the nation's food supply from growing your own food to selling or trading it among neighbors or friends to roadside stands to large processing plants that import or export food. This bill establishes a "Surveillance System" that can spy on farmers, gives the government authority to collect fees and requires reports from those growing food. This is essentially a food IRS putting the government between citizens and their ability to survive. Sold as a mandate to protect the food supply from contamination, the bill contains in it the language which passed the Senate on November 30 by a 73-25 margin. It will be sent back to the Senate for approval because all appropriations bills must originate in the House. This is a lame duck tyrannical power grab by the very people Americans voted out of office on November 2. 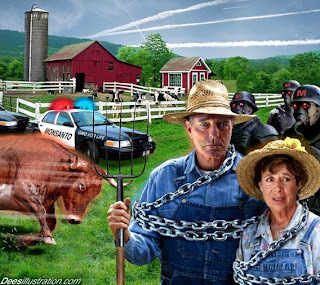 These people at the very least should be charged with high crimes and misdemeanors and tried for their insidious attempt to exercise federal and international control over the food supply of this nation. It is written as a measure of protection for the people, but language is open to absolute federal and international authority over the food supply. This legislation sets the stage for the Revelation prophecy to be carried out legally in the United States. There will now be a system established that could incentivize turning in you neighbor for growing food, allows international authority over your land, and provides a fee system that can increase food costs at will. "If any man worship the beast and his image, and receive his mark in his forehead, or in his hand, the same shall drink of the wine of the wrath of God, which is poured out without mixture into the cup of his indignation; and he shall be tormented with fire and brimstone in the presence of the holy angels, and in the presence of the Lamb." "Therefore take no thought, saying, What shall we eat? Or, What shall we drink?, or wherewithal shall we be clothed?...But seek ye first the kingdom of God and his righteousness; and all these things shall be added unto you."